Dhaka, Oct 10: A Bangladeshi court on Wednesday sentenced 19 people to death and awarded life imprisonment to 19, including former Premier Khaleda Zia’s son Tarique Rahman in the case of the grenade attack on an Awami League rally in Dhaka on August 21, 2004 that killed 24 people and injured 500, including then Opposition leader and present Prime Minister Sheikh Hasina. Ms. Hasina survived the attack with a partial hearing loss. 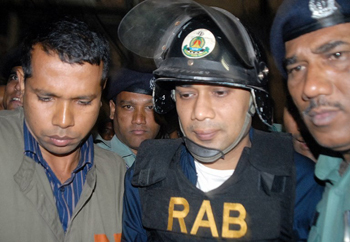 Rahman, senior vice president of the Bangladesh Nationalist Party (BNP), who lives in exile in London, is among those sentenced to life imprisonment. Investigation found that an influential quarter of the then BNP-led government, including Rahman, masterminded and sponsored the attackers — operatives of Harkat-ul Jihad al Islami (HuJI).